Today’s guest post is from friend of the blog and Mormon Matters alum Bruce Nielson. It’s good to make informed decisions, so I’m going to quickly explain how the political process works mathematically and then it becomes easy to work out if these claims are true and to come up with your best voting decisions. First, the US electoral college is a winner-take-all / majority wins system. You have to get 270 votes to win and if no one gets 270 votes, the House of Reps get to pick the president instead of the electoral college. So because this is the case, if Utah ends up voting for McMullin and giving him their electoral votes this in no way helps Hillary. Stop and do the math and you’ll see why this is the case. What it does is it removes some of the votes from the pool, so it harder to get to 270. It does not mean it makes it easier for Hillary to win. The simple truth is that it doesn’t help Hillary at all unless you believe Utah going McMullin would actually throw the election to the House of Reps and the House would likely pick her over Trump. Give that congress is majority Republican right now, that simply is not going to happen, period. So there is simply no realistic case at all in which Utah going McMullin would in some sense be a vote for Hillary. You might now be wondering why people always say that if you vote for a third party candidate, you’re giving your vote to the candidates furthest from your view. Am I saying that everyone that says this is wrong? Actually, no. You see, usually when you have a third-party candidate, they don’t actually win any electoral votes at all. They simply steal votes from one of the other two candidates. 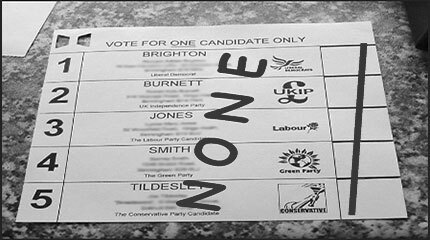 Worse yet, they steal votes from the candidate next closest to them. So, for example, Ross Perot primarily stole votes from George Bush, not Bill Clinton, thereby putting Bill Clinton into office. So, yes, in fact a vote for Ross Perot was really a vote for Bill Clinton, exactly like people claim. What those mad at McMullin don’t get is that he’s on his way to actually winning Utah which is a total and complete mathematical game changer. The issue here is that to win a state is not based on a majority vote, but merely a plurality vote. So let’s say Hillary gets 26% of Utah and McMullin and Trump get 25% each. (With the rest going to various other candidates.) In such a case, Hillary takes Utah and gets all the electoral votes. In this case, yes a vote for McMullin is in fact quite literally a vote for Hillary Clinton. However, if McMullin actually takes Utah then he gets the electoral votes, and therefore a vote for McMullin is not a vote for Hillary. Check the polls before you vote. If McMullin is going to win Utah most likely–and you don’t want Hillary to win–then vote for McMullin. Your vote will not actually be helping Hillary at all. The worst-case scenario then is that you’re effectively still voting for Trump, but out of protest you sent a message to the GOP by helping Utah given its votes to someone else instead. Political statements like this should not be overlooked. If Utah fails to give its votes to Trump, a historical event like this will likely send shock waves through the Republican Party, and might even cause an incumbent “President Trump” to lose the Republican nomination in 4 years. So in such a case, a vote for McMullin is only sort of a vote for Trump but is also a strong statement that the Republicans need to shape up. However, if on voting day it looks like McMullin isn’t going to win Utah, then stay home and don’t vote and Trump will win Utah. I know, I know, we have a civic duty to vote, and only bad people don’t vote. That’s all total crap of course. Staying home and not voting is a perfectly legitimate political move in some cases. This might be one of them. In that case, you won’t be helping anyone either way. This could only be said by people who so completely don’t understand what McMullin is doing that they sincerely think people voting for him are trying to win. Since no one – not even McMullin – believes he could ever win, then *obviously* his qualifications don’t matter at all. Qualifications are only relevant for candidates that have a chance of winning. McMullin is a protest vote — plain and simple. This is the key point people claiming a vote for McMullin is a vote for Hillary are not understanding. If you want to, that is. I’m not advising people how to vote. Low voter turn out is also a messages, though granted no where near as strong as neither Trump nor Hillary taking Utah. Side Note: The winner-take-all / majority wins system is why we have a two party and only two party system. Since voting for a third party is really (in most cases) a vote for the party furthest from your views, obviously there is strong political incentive for two of the parties – the ones closest ideologically – to merge so they have any chance at all of winning the presidency. Also, it’s helpful to note that there are other forms of democracy that are not winner-take-all that create multi-party systems. But these are horrific aberrations of democracy that lack all the good parts. For example, such systems favor the *third largest* party. Think about this mathematically and you’ll see why. The two largest parties battle to be either #1 or #2. But to form an actual government, they need a majority support in the legislature, so they have to make deals and compromises with the next largest party that isn’t their main competitor (i.e. third largest). But since no matter who wins the #1 spot they’ll both have to make a deal with the third largest party, you’re essentially creating a permanent government largely controlled by the 3rd largest party — and with no way to ever vote them out of office. Are you so sure you really want a multi-party system instead of a two-party system? Not that I care if McMullin takes Utah, but on the incredibly improbable chance that he does and it causes the election to go to the House (which relies on Trump winning a bunch of states that he’s currently behind in to work), there’s no guarantee that Trump is elected, even though it’s GOP controlled. As far as I’m aware, 40 House Republicans have refused to endorse Trump, and the Democrats only need a 31 member swing from the GOP to elect Clinton. It’s no secret that Trump is openly despised by a lot of establishment Republican politicians. I think it largely depends on how down-ballot elections go. If the Democrats win big in the House and Senate, I think lame duck Republican House members would be more likely to hold their nose and vote for Trump to keep the Democrats from having a political blank check until at least the 2018 Midterms. On the flip side, if the GOP largely retains control of Congress, enough anti-Trump Republican House members might be inclined to give Clinton the edge because a) the recognize Trump is a disaster and b) a GOP controlled Congress would be able to keep Clinton from doing anything too far left of the GOP political agenda. At any rate, I agree with OP that a vote for a 3rd party candidate is not a vote for “the opposition”, whoever that may be. At the very least, 3rd party voters are showing their displeasure with both major parties, which may send a message to one or both of them that they need to step up their game. ^^That was my first thought, too. First of all I don’t believe Hillary will fail to reach the 270 electoral votes so the question is moot. But sending an anti Trump message to the GOP is certainly worthwhile in whichever form it comes: a vote for Clinton, McMullin or Mickey Mouse. Personally I don’t see the Hillary hatred as reasonable. She’s very moderate. She didn’t wow me in the debates with Trump, but his content was so outrageous and insane that I’m not sure how you debate it. When she debated Sanders she came across very well IMO. It was absolutely surreal to me to hear Trump criticize Reagan and Clinton praise him in the third debate. To me it looks like most of the Hillary hatred comes from two things: 1) believing the exaggerated criticisms of her actions that Fox News types consider accurate, and 2) old fashioned straight up sexism. Not to be pedantic, but if the election goes to the House of Representatives, it does not necessarily matter that the Republicans have control in terms of sheer numbers. Under the Constitution, each state gets one vote for president in that scenario, which means that it would be up to the delegations from each state to vote internally to decide which of the top three candidates receiving electoral votes would get that state’s vote for president. Thus, in the case of California, 53 representatives would vote to determine California’s vote–which would almost certainly be for Clinton since 39 of the 53 representatives are Democratic. More interesting would be Arizona, with 9 representatives split 5-4 for the GOP….and not all of them are Trump supporters. In that case, theoretically any of the three candidates could win Arizona’s vote. As intriguing as this outcome would be–and as an academic who studies these things I have a vested interest–I think it is a virtual certainty that Clinton wins the election with over 300 electoral votes. The more interesting question will be what the GOP looks like going forward. Is there early voting in Utah? This matters because polls conducted during the early voting period tend to be less reliable than those conducted earlier. A lot of folks who a few weeks earlier were willing to say who they favor are NOT willing to share who they actually voted for. It makes those last-minute polls a real pain to conduct. So I am not sure that checking the polls before you vote is that great of advice. I don’t think Utah matters much at all, with it’s teensy number of electoral college votes. I do admire McMullin for taking this on. Yes early voting is available in Utah. Great post Bruce. I’ll be posting links when I see so many people complaining about voting for McMullin is voting for Hillary. Excellent information. The only thing you forgot to cover is why members do not vote with intelligence and go for Hillary! As DJ has said the Republican Controlled House factor does not ensure a Hillary block! If you go down the list of Congressman, the three states that contain the majority of those Republican representatives are Pennsylvania, Texas, and Florida. Many states have just one or two Democrat representatives, a couple states are split evenly between the two parties, and a few states have Republicans that are the same Christian Evangelicals that voted against the last Mormon that ran, and some states have representatives that are establishment and would vote Hillary over Trump. To generalize and say that the Republican controlled house would throw the vote to the Republicans is either deceiving or ignorant from what I can tell based on my own ignorance. The way I see the states set up from my own looking at the representative list is we nearly have an equal draw between Hillary and Trump, give or take three or four states based on what we can tell by those representatives appetite for Trump. From what I can see, Nevada, South Dakota, and Colorado could go either way and tip the balance to either candidate, meaning we are gambling with this third party candidate. It’s not so much how many Republicans are in the house but how they are distributed. Evan fails to explain that, and he needs to if he’s honest about his intentions!! I have searched high and low and he has not said a word about this as far as I can find. Excellent analysis of when it is entirely safe to “protest vote” and when it is not. I’d add just one thing to the House analysis. The House selects among the 3 candidates who receive the most votes from the Electoral College. I don’t see how McMullin ever gets in the top 3. It would only take 7 “faithless electors” uniting on a particular candidate to pass McMullin and eliminate him. Although there are laws in some states the require electors to stick with the winner of the state’s popular vote, their constitutionality hasn’t been tested and as a practical matter they may not be enforceable. So … I have to wonder .. is McMullin really a stalking horse for … who? Not the main point of the original post, I grant it, but I will argue the very final point where you claim that a two party system is the best democractic system. Many democractic countries around the world would disagree with you. My country has currently five parties in government and my personal ideal would be a minority multiparty government. It means no one party can act like a dictatorship, where by virtue of having bodies in seats it can unilaterally pass everything. Instead to get anything passed it must work with people who hold different views and there is some give and take, some we gain this point by conceding this other point. Is it harder to functional this way? Yes. But at the end of the day if people are willing to put in the effort we get solutions that everyone can work with. As an added bonus, if the “largest” party in the government goes off in an extreme direction, the other parties, who also represent viewpoints of the electorate, can rein them in. 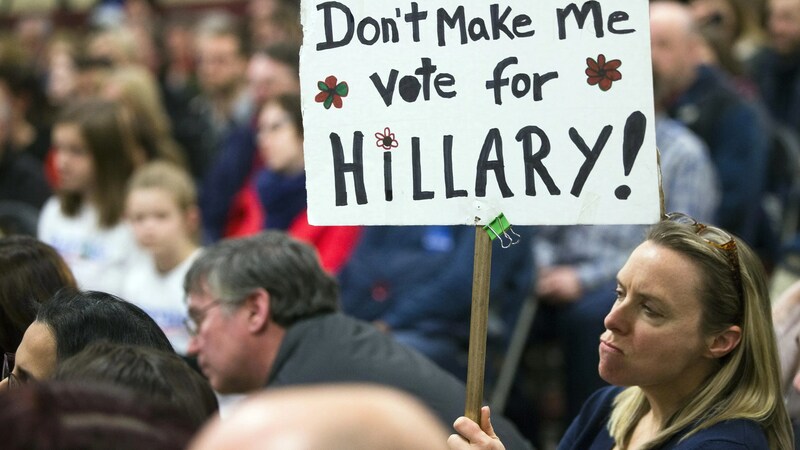 Hawkgrrl, there is a 3rd reason some won’t vote for Hillary. They are people that work for the government and have security clearances. They take annually training, and have seen coworkers disciplined, and lose their clearance (and their job) for far less that Hillary did on her private server. I have a coworker who was disciplined for sending one unclassified e-mail about a work related issue from her personal e-mail account. She knew what she was doing. It is that attitude that she can get away with it that is forcing many in civil service to not vote for her. Niki la: Personally I agree that we should expand beyond our two-party system. It’s creating stupider voters, not wiser. But so long as we have an electoral college and 270 to win, we’ll have a two-party system. If we did a popular vote, that would revolutionize our parties overnight. Unfortunately, I don’t see the electoral college retiring any time soon. I am trying to figure out what the protest vote is against. Is it because Hillary is a women and Church leaders have a long history of putting women down and members follow ? Is it against competence? Who wants a competent President? Is it because she is not a misogynist? Is it because she is a democrat and all democrats are evil? Maybe it is because of ethical problems? In that case, vote Trump. He has no ethical problems at all. Mike: It’s because they believe the decades-long smears of Hillary that may have been originally rooted in sexism, but are most certainly rooted in partisan politics. When I look into the specific claims against Hillary, do I see some things I don’t like? Sure. But I don’t see anything nearly as alarming as the Fox News / Drudge slurs against her as “corrupt” and “treasonous” or the conspiracy theory stuff that she murders her rivals and has rigged the election(!). That’s conservative propaganda, but when you are a conservative, you have already bought into that stuff–now it’s emotional. Trying to switch teams is tough when that’s your starting point. We shouldn’t be so eager to believe the political opposition, whichever side says it. In the case of Trump, his own words condemn him. I’ll admit I’m getting awfully tired of the notion that the *only* legitimate reason not to like or support Hillary Clinton is sexism or a Republican smear campaign.